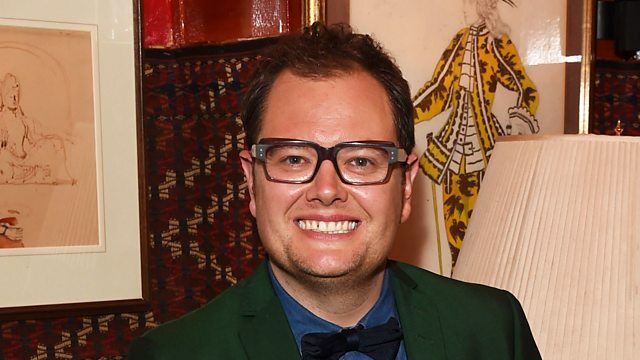 Alan Carr, comedian and chat show host, is known for his love of silliness, dressing up and camp daftness. His stand-up shows have filled arenas, and on TV he co-hosted the Friday Night Project and then his own show - Chatty Man. Alan was born into a footballing family – his dad, Graham, was a professional player and then a manager. Alan first tried his hand at comedy while reading Theatre Studies at Middlesex University. After he graduated, he took on a range of jobs before his ability to make friends laugh with his stories of working in a call centre in Manchester led him to try stand-up at a local venue. In 2001 he won the City Life Best Newcomer of the Year and the BBC New Comedy Awards. His break into TV came after a spell as the warm-up man for the Jonathan Ross chat show. He has won many awards including Best Entertainment Show for Alan Carr: Chatty Man at the 2010 TV Choice Awards, the 2013 BAFTA for Best Entertainment Performance and 2013 British Comedy Award for Best Comedy Entertainment Personality. In 2015 he won the National Television Award for Best Chat Show Host. He and his long term partner Paul were married in January 2018 by Adele - who also organised the wedding, and paid for it. What did Lauren Laverne discover from the comedian's Desert Island Discs? Hey Now Hey (The Other Side of the Sky). The Best of Peggy Lee: The Capitol Years. Subscribe or download individual episodes. Click above to browse castaways, from 1942 to today. Or use the BBC search to find a castaway. To search, type ‘Desert Island Discs’ plus the castaway’s name. Read the surprising things we've learned about some stand-out castaways. Featuring David Beckham, the funniest and most moving moments, animations and quizzes. Castaway guests share the soundtrack of their lives.